Indian jewellery designers are in love with gemstones and thus, Indian jewellery is vivid and colourful. 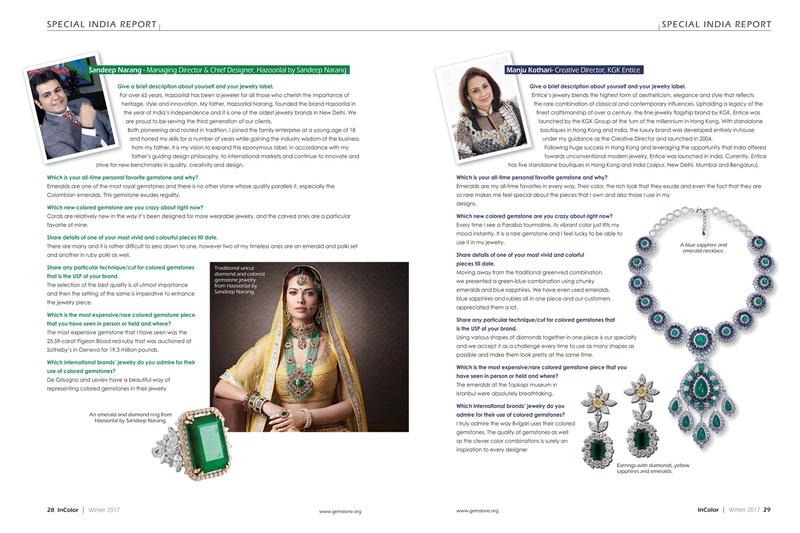 Read on as I speak to the next generation of India’s jewelry ambassadors and get to know about the impressions that various gemstones have left in their life. 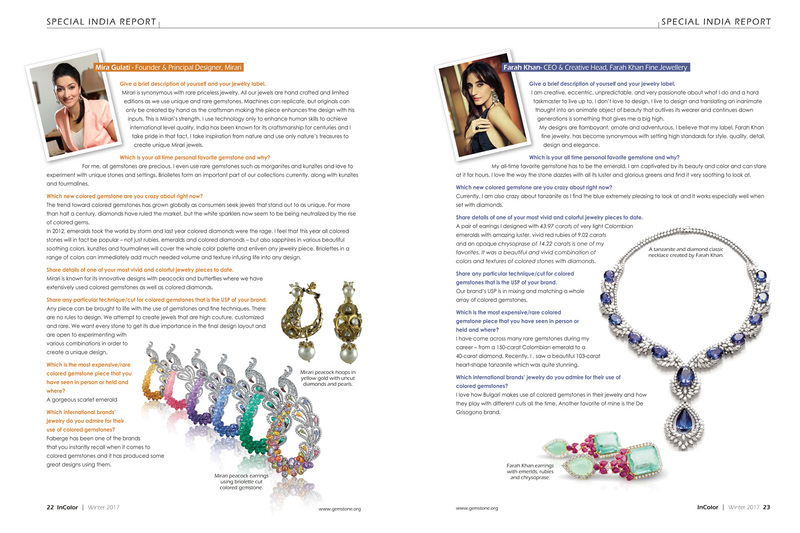 Written as part of the ‘Special India Report’ of the InColor magazine. Give a brief description of yourself and your jewelry label. My father Rajeev Arora and my uncle Rajesh Ajmera started Amrapali in 1978. What started as a passion is now one of the most renowned jewelry brands in India. I have grown up seeing their passion and it is my honor to take this brand forward. Which is your all time personal favorite gemstone and why? I would have to say emeralds for their elegance and beauty. The fact that every single piece of emerald is different from each other, even if has been extracted from the same mine and same piece of rough. Even the huge array of shades that emeralds come in adds a lot of excitement. Which new colored gemstone are you crazy about right now? The whole world should be crazy about emeralds this year as Pantone’s color of the year for 2017 is Greenery, and what best than soft hues of emeralds? Apart from that, we also exploring deep Blue Sapphires as they have never got their full justice due to the astrological myths surrounding them in India. Share details of one of your most vivid and colorful jewelry pieces to date. 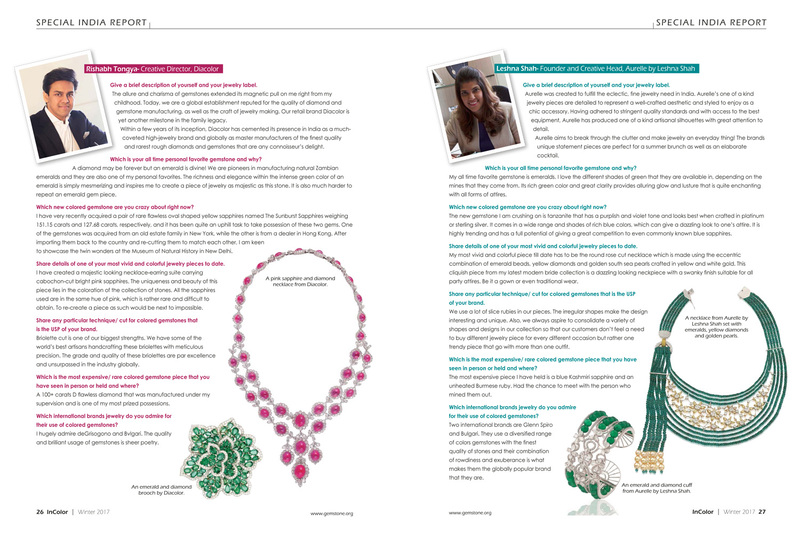 Our ‘Bloosom’ necklace created for Gemfields’ Nanhikali campaign was one of our most colorful and grand pieces. Thin diamonds made the skeleton of the necklace with ruby flowers and carved emerald leaves interspersed. Share any particular technique/cut for colored gemstones that is the USP of your brand. Our Lotus cut used primarily for rubies has become synonymous with our brand as the same motif is also a part of our new logo. We were so mesmerized by the final look of this cut that we had to use it in our brand revamp and our re-branding team did full justice to it. Which is the most expensive/rare colored gemstone piece that you have seen in person or held and where? Instead of a gemstone, a 550-carat rough diamond would qualify for this. I had the chance to see this internally flawless piece of beauty at De Beers’ office during my course at GIA. I have also had a chance to see a chameleon diamond that changes it color from olive green to yellowish orange according to the light conditions. Which international brands’ jewelry do you admire for their use of colored gemstones? Wallace Chan is my all time favorite jewelry designer for his work in every way. From his use of colored gemstones to techniques that he uses to the thoughts that are behind each piece; everything inspires me and at times even leaves me puzzled. I have been in this business for 15 years now, and at Ganjam I take care of gemstone and diamond procurement, manufacturing and even design. Building new brand strategies is something that we all do together along with our team. Emeralds are known for their grace, and I personally love its color. As we also do both Indian as well as contemporary styled jewelry, emeralds are one gemstone that work best with both types and looks beautiful on most Indian skin types. It also suits most clothes and color palettes. I am truly amazed by the mystic colors of Paraiba tourmaline. Its swimming pool blue color is very eccentric and appealing. We still haven’t got one at Ganjam, but I am sure whenever we do get one it would be of the best quality and a substantial size. Our Gerbera collection is one of the most vivid creations that has come out of our design studio to date. Ganjam is known for its flawless color gradations. Our Gerbera and Exotica collections use a range of colored gemstones that gently flow through a whole gamut of shades. In Gerbera, we use sapphires from yellow to orange to deep red and our talented team matches each step of gradation painstakingly. Even in our Exotica collection, colored gemstones flow in all shades of blue to green. During one of my trips to Germany, I had a chance to see an 89-90 carat demantoid garnet. The beauty of that gemstone is still fresh in my mind. Which international brands jewelry do you admire for their use of colored gemstones? I truly admire Graff for their use of colored diamonds in the finest of quality. Mirari is synonymous with rare priceless jewelry. All our jewels are hand crafted and limited editions as we use unique and rare gemstones. Machines can replicate, but originals can only be created by hand as the craftsman making the piece enhances the design with his inputs. This is Mirari’s strength. I use technology only to enhance human skills to achieve international level quality. India has been known for its craftsmanship for centuries and I take pride in that fact. I take inspiration from nature and use only nature’s treasures to create unique Mirari jewels. For me, all gemstones are precious. I even use rare gemstones such as morganites and kunzites and love to experiment with unique stones and settings. Briolletes form an important part of our collections currently, along with kunzites and tourmalines. The trend toward colored gemstones has grown globally as consumers seek jewels that stand out to as unique. For more than half a century, diamonds have ruled the market, but the white sparklers now seem to be being neutralized by the rise of colored gems. In 2012, emeralds took the world by storm and last year colored diamonds were the rage. I feel that this year all colored stones will in fact be popular – not just rubies, emeralds and colored diamonds – but also sapphires in various beautiful soothing colors, kunzites and tourmalines will cover the whole color palette and enliven any jewelry piece. Briolettes in a range of colors can immediately add much needed volume and texture infusing life into any design. Mirari is known for its innovative designs with peacocks and butterflies where we have extensively used colored gemstones as well as colored diamonds. Any piece can be brought to life with the use of gemstones and fine techniques. There are no rules to design. We attempt to create jewels that are high couture, customized and rare. We want every stone to get its due importance in the final design layout and are open to experimenting with various combinations in order to create a unique design. Faberge has been one of the brands that you instantly recall when it comes to colored gemstones and it has produced some great designs using them. I am creative, eccentric, unpredictable, and very passionate about what I do and a hard taskmaster to live up to. I don’t love to design, I live to design and translating an inanimate thought into an animate object of beauty that outlives its wearer and continues down generations is something that gives me a big high. My designs are flamboyant, ornate and adventurous. I believe that my label, Farah Khan fine jewelry, has become synonymous with setting high standards for style, quality, detail, design and elegance. My all-time favorite gemstone has to be the emerald. I am captivated by its beauty and color and can stare at it for hours. I love the way the stone dazzles with all its luster and glorious greens and find it very soothing to look at. Currently, I am also crazy about tanzanite as I find the blue extremely pleasing to look at and it works especially well when set with diamonds. A pair of earrings I designed with 43.97 carats of very light Colombian emeralds with amazing luster, vivid red rubies of 9.02 carats and an opaque chrysoprase of 14.22 carats is one of my favorites. It was a beautiful and vivid combination of colors and textures of colored stones with diamonds. Our brand’s USP is in mixing and matching a whole array of colored gemstones. 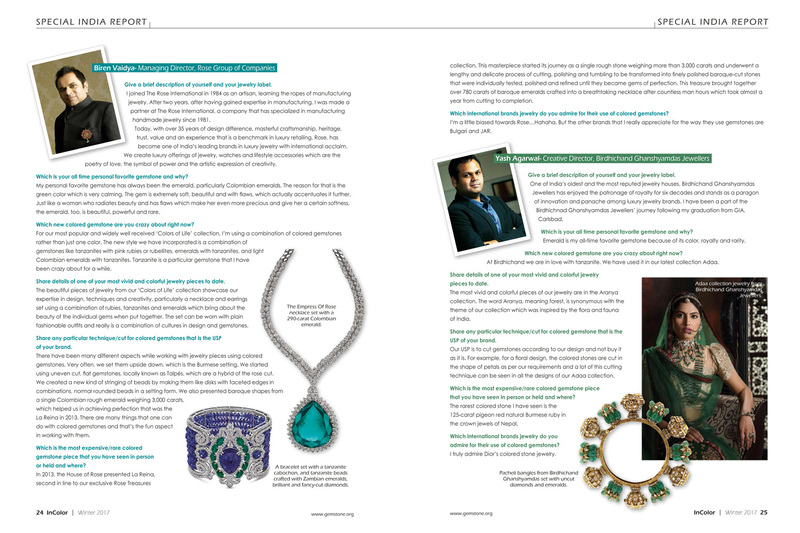 I have come across many rare gemstones during my career – from a 150-carat Colombian emerald to a 40-carat diamond. Recently, I , saw a beautiful 103-carat heart-shape tanzanite which was quite stunning. I love how Bulgari makes use of colored gemstones in their jewelry and how they play with different cuts all the time. Another favorite of mine is the De Grisogono brand. I joined The Rose International in 1984 as an artisan, learning the ropes of manufacturing jewelry. After two years, after having gained expertise in manufacturing, I was made a partner at The Rose International, a company that has specialized in manufacturing handmade jewelry since 1981. Today, with over 35 years of design difference, masterful craftsmanship, heritage, trust, value and an experience that is a benchmark in luxury retailing, Rose, has become one of India’s leading brands in luxury jewelry with international acclaim. We create luxury offerings of jewelry, watches and lifestyle accessories which are the poetry of love, the symbol of power and the artistic expression of creativity. My personal favorite gemstone has always been the emerald, particularly Colombian emeralds. The reason for that is the green color which is very calming. The gem is extremely soft, beautiful and with flaws, which actually accentuates it further. Just like a woman who radiates beauty and has flaws which make her even more precious and give her a certain softness, the emerald, too, is beautiful, powerful and rare. For our most popular and widely well received ‘Colors of Life’ collection, I’m using a combination of colored gemstones rather than just one color. The new style we have incorporated is a combination of gemstones like tanzanites with pink rubies or rubellites, emeralds with tanzanites, and light Colombian emeralds with tanzanites. Tanzanite is a particular gemstone that I have been crazy about for a while. The beautiful pieces of jewelry from our ‘Colors of Life’ collection showcase our expertise in design, techniques and creativity, particularly a necklace and earrings set using a combination of rubies, tanzanites and emeralds which bring about the beauty of the individual gems when put together. The set can be worn with plain fashionable outfits and really is a combination of cultures in design and gemstones. There have been many different aspects while working with jewelry pieces using colored gemstones. Very often, we set them upside down, which is the Burmese setting. We started using uneven cut, flat gemstones, locally known as Talpés, which are a hybrid of the rose cut. We created a new kind of stringing of beads by making them like disks with faceted edges in combinations, normal rounded beads in a setting form. We also presented baroque shapes from a single Colombian rough emerald weighing 3,000 carats, which helped us in achieving perfection that was the La Reina in 2013. There are many things that one can do with colored gemstones and that’s the fun aspect in working with them. In 2013, the House of Rose presented La Reina, second in line to our exclusive Rose Treasures collection. This masterpiece started its journey as a single rough stone weighing more than 3,000 carats and underwent a lengthy and delicate process of cutting, polishing and tumbling to be transformed into finely polished baroque-cut stones that were individually tested, polished and refined until they became gems of perfection. This treasure brought together over 780 carats of baroque emeralds crafted into a breathtaking necklace after countless man hours which took almost a year from cutting to completion. I’m a little biased towards Rose…Hahaha. But the other brands that I really appreciate for the way they use gemstones are Bulgari and JAR. One of India’s oldest and the most reputed jewelry houses, Birdhichand Ghanshyamdas Jewellers has enjoyed the patronage of royalty for six decades and stands as a paragon of innovation and panache among luxury jewelry brands. I have been a part of the Birdhichnad Ghanshyamdas Jewellers’ journey following my graduation from GIA, Carlsbad. Emerald is my all-time favorite gemstone because of its color, royalty and rarity. At Birdhichand we are in love with tanzanite. We have used it in our latest collection Adaa. The most vivid and colorful pieces of our jewelry are in the Aranya collection. The word Aranya, meaning forest, is synonymous with the theme of our collection which was inspired by the flora and fauna of India. Share any particular technique/cut for colored gemstone that is the USP of your brand. Our USP is to cut gemstones according to our design and not buy it as it is. For example, for a floral design, the colored stones are cut in the shape of petals as per our requirements and a lot of this cutting technique can be seen in all the designs of our Adaa collection. The rarest colored stone I have seen is the 125-carat pigeon red natural Burmese ruby in the crown jewels of Nepal. I truly admire Dior’s colored stone jewelry. The allure and charisma of gemstones extended its magnetic pull on me right from my childhood. Today, we are a global establishment reputed for the quality of diamond and gemstone manufacturing, as well as the craft of jewelry making. Our retail brand Diacolor is yet another milestone in the family legacy. 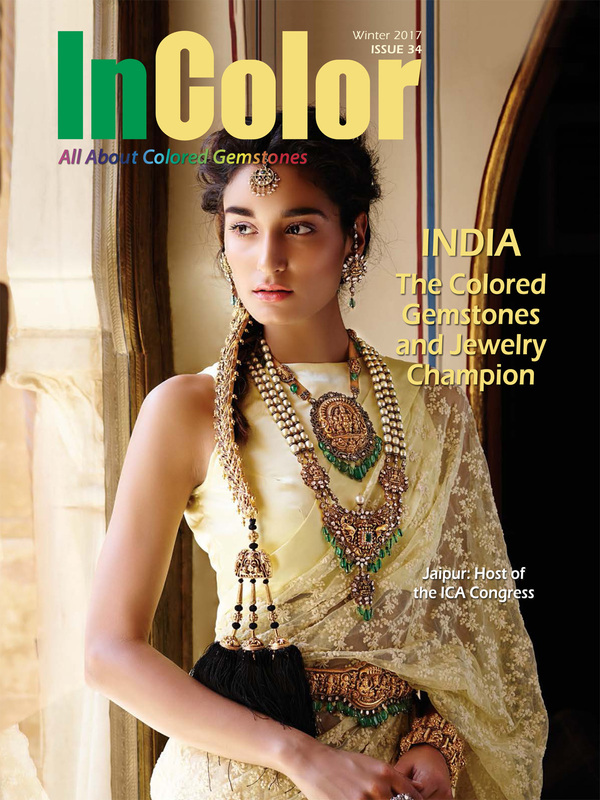 Within a few years of its inception, Diacolor has cemented its presence in India as a muchcoveted high-jewelry brand and globally as master manufacturers of the finest quality and rarest rough diamonds and gemstones that are any connoisseur’s delight. A diamond may be forever but an emerald is divine! We are pioneers in manufacturing natural Zambian emeralds and they are also one of my personal favorites. The richness and elegance within the intense green color of an emerald is simply mesmerizing and inspires me to create a piece of jewelry as majestic as this stone. It is also much harder to repeat an emerald gem piece. I have very recently acquired a pair of rare flawless oval shaped yellow sapphires named The Sunburst Sapphires weighing 151.15 carats and 127.68 carats, respectively, and it has been quite an uphill task to take possession of these two gems. One of the gemstones was acquired from an old estate family in New York, while the other is from a dealer in Hong Kong. After importing them back to the country and re-cutting them to match each other, I am keen to showcase the twin wonders at the Museum of Natural History in New Delhi. I have created a majestic looking necklace-earring suite carrying cabochon-cut bright pink sapphires. The uniqueness and beauty of this piece lies in the coloration of the collection of stones. All the sapphires used are in the same hue of pink, which is rather rare and difficult to obtain. To re-create a piece as such would be next to impossible. Share any particular technique/ cut for colored gemstones that is the USP of your brand. Briolette cut is one of our biggest strengths. We have some of the world’s best artisans handcrafting these briolettes with meticulous precision. The grade and quality of these briolettes are par excellence and unsurpassed in the industry globally. Which is the most expensive/ rare colored gemstone piece that you have seen in person or held and where? A 100+ carats D flawless diamond that was manufactured under my supervision and is one of my most prized possessions. I hugely admire deGrisogono and Bvlgari. The quality and brilliant usage of gemstones is sheer poetry. Aurelle was created to fulfill the eclectic, fine jewelry need in India. Aurelle’s one of a kind jewelry pieces are detailed to represent a well-crafted aesthetic and styled to enjoy as a chic accessory. Having adhered to stringent quality standards and with access to the best equipment, Aurelle has produced one of a kind artisanal silhouettes with great attention to detail. Aurelle aims to break through the clutter and make jewelry an everyday thing! The brands unique statement pieces are perfect for a summer brunch as well as an elaborate cocktail. My all time favorite gemstone is emeralds. I love the different shades of green that they are available in, depending on the mines that they come from. Its rich green color and great clarity provides alluring glow and lusture that is quite enchanting with all forms of attires. The new gemstone I am crushing on is tanzanite that has a purplish and violet tone and looks best when crafted in platinum or sterling silver. It comes in a wide range and shades of rich blue colors, which can give a dazzling look to one’s attire. It is highly trending and has a full potential of giving a great competition to even commonly known blue sapphires. My most vivid and colorful piece till date has to be the round rose cut necklace which is made using the eccentric combination of emerald beads, yellow diamonds and golden south sea pearls crafted in yellow and white gold. This cliquish piece from my latest modern bride collection is a dazzling looking neckpiece with a swanky finish suitable for all party attires. Be it a gown or even traditional wear. We use a lot of slice rubies in our pieces. The irregular shapes make the design interesting and unique. Also, we always aspire to consolidate a variety of shapes and designs in our collection so that our customers don’t feel a need to buy different jewelry piece for every different occasion but rather one trendy piece that go with more than one outfit. The most expensive piece I have held is a blue Kashmiri sapphire and an unheated Burmese ruby. Had the chance to meet with the person who mined them out. Two international brands are Glenn Spiro and Bulgari. They use a diversified range of colors gemstones with the finest quality of stones and their combination of rowdiness and exuberance is what makes them the globally popular brand that they are. Give a brief description about yourself and your jewelry label. For over 65 years, Hazoorilal has been a jeweler for all those who cherish the importance of heritage, style and innovation. My father, Hazoorilal Narang, founded the brand Hazoorilal in the year of India’s independence and it is one of the oldest jewelry brands in New Delhi. We are proud to be serving the third generation of our clients. Both pioneering and rooted in tradition, I joined the family enterprise at a young age of 18 and honed my skills for a number of years while gaining the industry wisdom of the business from my father. It is my vision to expand this eponymous label, in accordance with my father’s guiding design philosophy, to international markets and continue to innovate and strive for new benchmarks in quality, creativity and design. Which is your all-time personal favorite gemstone and why? Emeralds are one of the most royal gemstones and there is no other stone whose quality parallels it, especially the Colombian emeralds. This gemstone exudes regality. Corals are relatively new in the way it’s been designed for more wearable jewelry, and the carved ones are a particular favorite of mine. Share details of one of your most vivid and colourful pieces till date. There are many and it is rather difficult to zero down to one, however two of my timeless ones are an emerald and polki set and another in ruby polki as well. The selection of the best quality is of utmost importance and then the setting of the same is imperative to enhance the jewelry piece. The most expensive gemstone that I have seen was the 25.59-carat Pigeon Blood red ruby that was auctioned at Sotheby’s in Geneva for 19.3 million pounds. De Grisogno and Leviev have a beautiful way of representing colored gemstones in their jewelry. Entice’s jewelry blends the highest form of aestheticism, elegance and style that reflects the rare combination of classical and contemporary influences. Upholding a legacy of the finest craftsmanship of over a century, the fine jewelry flagship brand by KGK, Entice was launched by the KGK Group at the turn of the millennium in Hong Kong. With standalone boutiques in Hong Kong and India, the luxury brand was developed entirely in-house under my guidance as the Creative Director and launched in 2004. 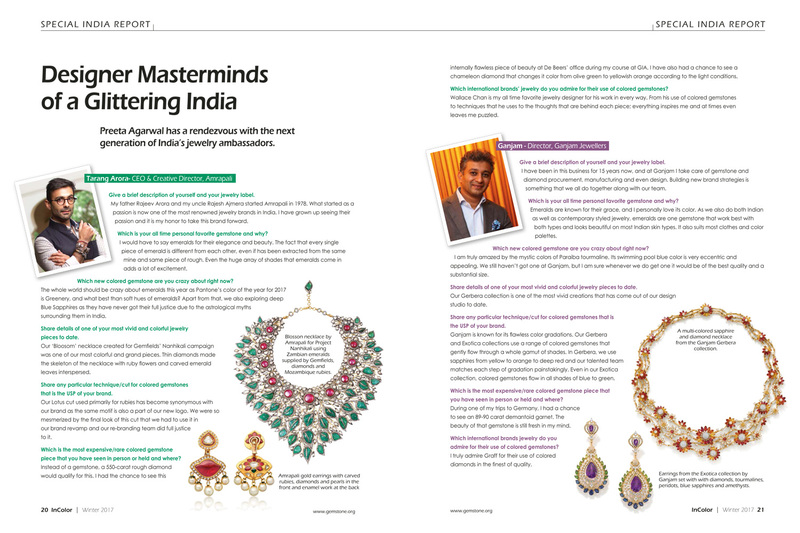 Following huge success in Hong Kong and leveraging the opportunity that India offered towards unconventional modern jewelry, Entice was launched in India. Currently, Entice has five standalone boutiques in Hong Kong and India (Jaipur, New Delhi, Mumbai and Bengaluru). Emeralds are my all-time favorites in every way. Their color, the rich look that they exude and even the fact that they are so rare makes me feel special about the pieces that I own and also those I use in my designs. Every time I see a Paraiba tourmaline, its vibrant color just lifts my mood instantly. It is a rare gemstone and I feel lucky to be able to use it in my jewelry. Share details of one of your most vivid and colorful pieces till date. Moving away from the traditional green-red combination, we presented a green-blue combination using chunky emeralds and blue sapphires. We have even used emeralds, blue sapphires and rubies all in one piece and our customers appreciated them a lot. Using various shapes of diamonds together in one piece is our specialty and we accept it as a challenge every time to use as many shapes as possible and make them look pretty at the same time. The emeralds at the Topkapi museum in Istanbul were absolutely breathtaking. I truly admire the way Bvlgari uses their colored gemstones. The quality of gemstones as well as the clever color combinations is surely an inspiration to every designer.